Amrut whisky.. Imported from India, can it be any good ? Of course it can.. 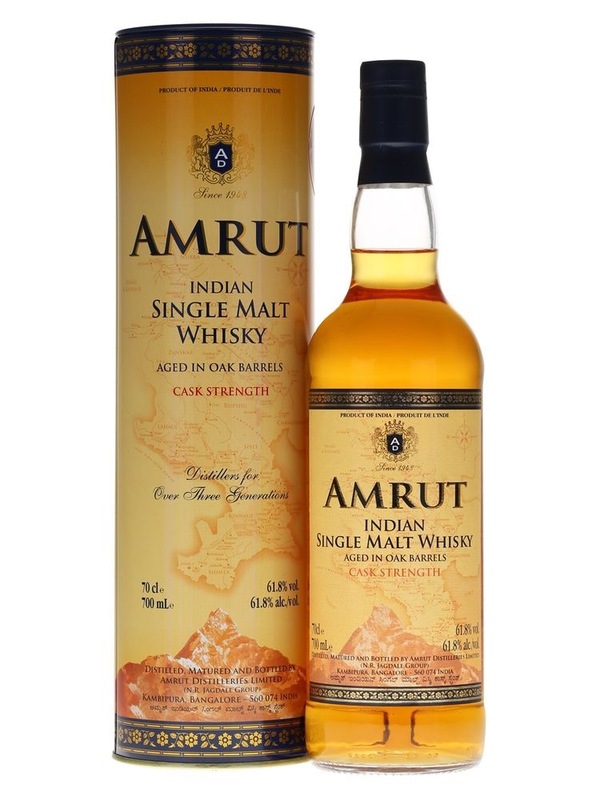 I have had a few other offerings from Amrut and they have been very good indeed, this is the cask strength version. Indian whisky is gathering pace as a whisky not to be ignored.. So go out and try some for yourself. Due to the hotter climate the whisky can have a higher abv than usual as water evaporates more than the alcohol, Therefore we get that higher strength, this version comes in at a very nice 61.8%.. Nose.. It starts off a little prickly, spices like ginger and pepper, then some vanilla mixed in with some oak notes, toffee and malted barley..
Palate.. A sweet smooth texture hits you first, toffee, butterscotch, and candied citrus peel, orange and a little bitter lemon mingle with some digestive biscuit and woody notes. There is a spice kick to it in the form of ginger, some coffee notes and a faint offering of coconut. Finish.. Not as long as I expected but pleasant enough.. A lingering aftertaste of oak and malted barley.. Thoughts.. Once you get to grips with the alcohol kick it becomes an enjoyable offering, sweet notes mingle with a spicy undertone. Another whisky that needs time, like anything in life.. Don’t rush it if you want to get everything it has to offer.. Previous Post Balvenie 41yo single cask. Next Post Glenrothes vintage reserve. I had a bottle of this, but not for long. I’m sure you will enjoy it when you find one..
I’ve had the standard Amrut offering, and the Fusion… Both were quite good. I will have to search this one out.